At the end of another day, we remember. Going to San Diego is great. We see our old friends and we always meet new ones. We have a great time, even with the long hours working at the booth. We were tired every night, but away we went at dinners and bars, because that's when you have time to relax and talk to the people you know you never see during the convention because everybody is busy working. Every morning, we were early eating and getting our strength back, for another day of awesomeness was waiting for us. Now it's time to get back to work. All of you, go! Let's make more comics! Let's be great, let's succeed, fail, make mistakes and learn. Most of all, let's tell more stories. We're having a great time at the Comicon this year. Had a awesome signing (thanks to everyone who stop by) with people bringing Roland, Casanova, De:TALES, Umbrella Academy and BPRD. It really show that people are starting to follow our work. It shows we have a work. We were on the Vertigo panel about the new series and the crime line. Here's a little of our share of it. We won't have a booth this year, which means we'll be everywhere. Look for us, stop us on the street, be friendly. You'll have plenty of chances to find us. If we're not on a panel or not signing, chances are we're hanging around at the coolest booth of the con (#1322) with our friends Becky Cloonan, Jill Thompson, Brian Wood and Cliff Chiang, so make sure you stop at their booth, 'cause they have the coolest looking books out there! WE WILL HAVE A BOOTH!! And it is exactly booth #1322 with Becky Cloonan, Vasilis Lolos, Jill Thompson, Brian Wood and Cliff Chiang. We won't be there all the time, but now it is much easier to find us!! It's a new beginning for Vertigo with the launch of new ongoing titles such as The Unwritten, Greek Street & Sweet Tooth. In addition to these titles we will be launching the highly anticipated Vertigo Crime Line with some of the top talents in the industry. Hosted by Senior VP - Executive Editor, Vertigo, Karen Berger and Senior Editor Will Dennis, this panel is not to be missed, especially considering the talent present: Peter Gross (Unwritten), Jeff Lemire (Sweet Tooth, The Nobody), Jason Starr, Chris Gage, Gabriel Bá, Fábio Moon and others! 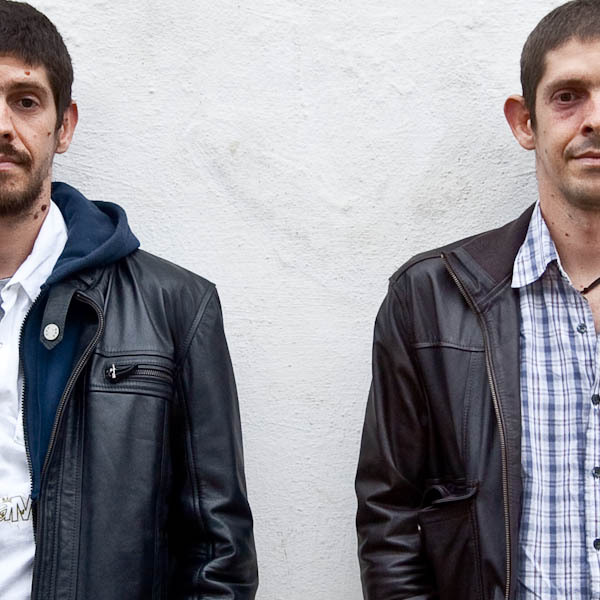 Meet Eisner Award–winning Brazilian cartoonist Fábio Moon (Sugar Shock!, 5) as he shares his love for comics and talks about working with his twin brother Gabriel Bá (Umbrella Academy), collaborating with high-profile creators Matt Fraction (Casanova), Joss Whedon (Buffy), and Mike Mignola (Hellboy) and what's next. Lots of images to show, with a fun Q&A to follow. I think I'll have a signing right after the panel, somewhere, somehow. I'll update this space as soon as I know more. Vertigo, DC's edgiest and most provocative imprint, returns to San Diego! Come and discover what's going on at the imprint that birthed The Sandman, Preacher, Y: The Last Man, Fables and more? 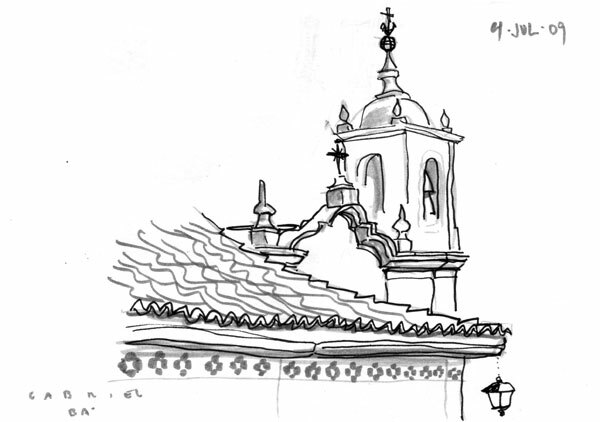 Wait 'til you hear about what new projects the Vertigo team is going to thrill us with next! Hosted by Senior VP - Executive Editor, Vertigo, Karen Berger, Group Editor Shelly Bond, and Senior Editor Will Dennis, with Jason Aaron (Scalped), Mike Allred, Mark Buckingham (Fables), Josh Dysart (Unknown Soldier), Peter Gross (Unwritten), Amy Hadley (Madame Xanadu), Jeff Lemire (The Nobody), Chris Roberson, Matt Sturges (House of Mystery), Matt Wagner (Madame Xanadu), Bill Willingham (Fables, House of Mystery), G. Willow Wilson (Air), Brian Wood (DMZ, Northlanders), and others (WE ARE THE OTHERS)! Lots of friends were nominated, and Bá was nominated, and here we go again to see what will stand out in the middle of an outstanding year for comics. 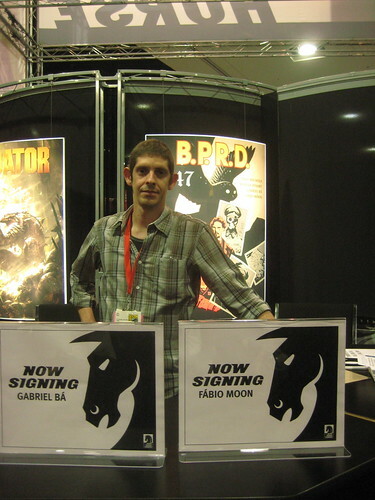 -5:00pm - 6:00pm - signing with Fábio Moon and Gabriel Bá at the Comic Relief booth. 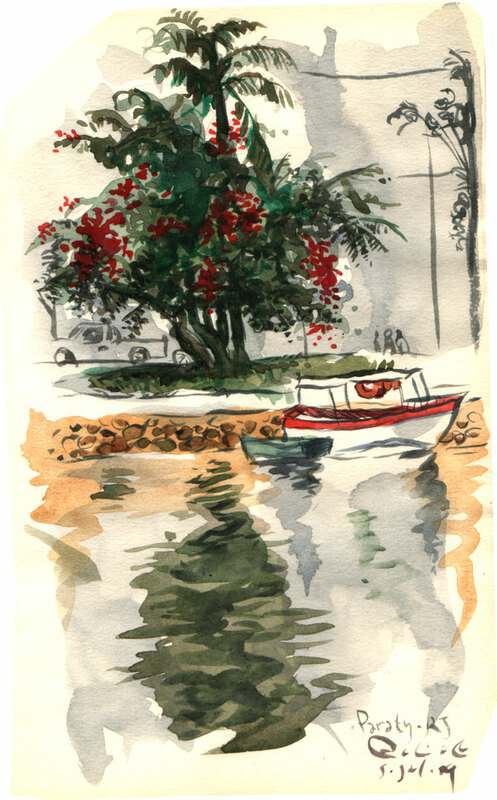 We had some time to sketch during our weekend at the Festival in Paraty. No pressure, no worries, no plan. 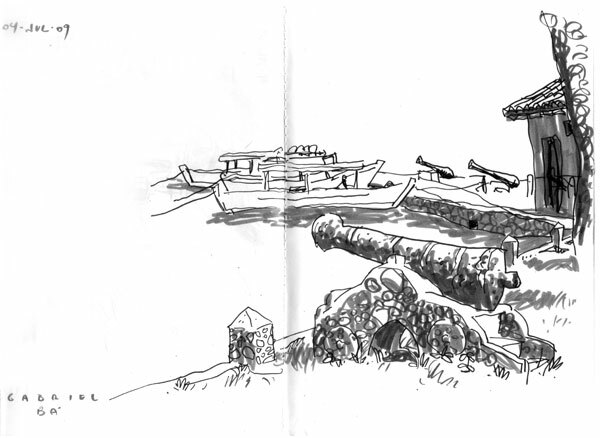 Drawing is fun, you know, and some times we can forget that part. 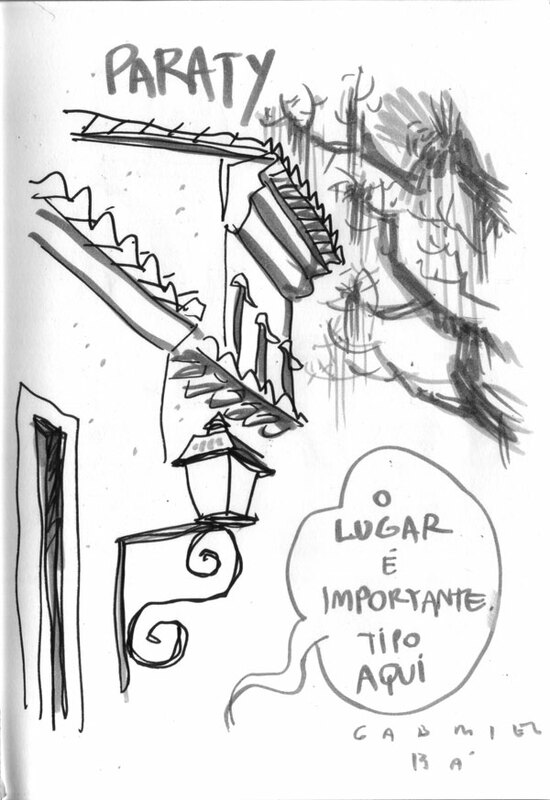 photo by Tomás Rangel, taken this past weekend during the literary festival in Paraty. 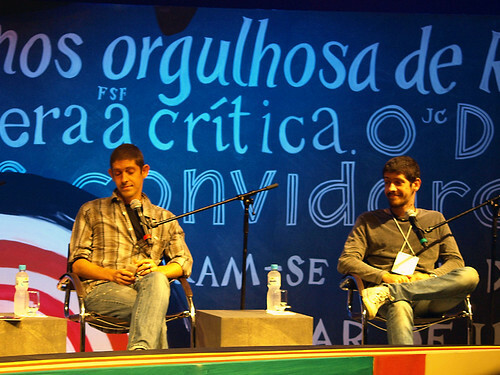 photo by Sergio Fonseca of our talk (which opened the festival's program). July has begun with horror! Our new enterprise into the helms of horror will hit the stores this week. PIXU: Mark of Evil!, the collected, hardcover edition of our Harvey nominated mini-series done last year with Becky Cloonan and Vasilis Lolos. Beautiful book! And BPRD: 1947 part 1 of 5, the dream of every cartoonist, working with Mike Mignola on the Hellboy-verse, and there're Vampires! As the publishers start to announce their panels on the San Diego Comic Con, we start to have a notion of how busy (or not) the convention will be for us this year. Since we won't have a table anywhere, if you want to find us you better go to these panels. We'll have some signings as well, and we'll post them here closer to the event.